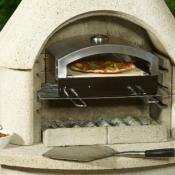 Barbecue tools make the best Birthday and Christmas gifts for anyone who loves to cook outdoors. These selected BBQ tool sets will last for years so you will be remembered for buying a quality present for your boyfriend, husband, dad or friends. Choose from economy tool sets to top quality stainless steel with an aluminium case. We have BBQ tool belts. aprons and even tools for the golfer who loves to barbecue. 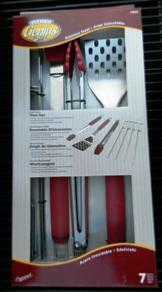 Professional tools sets from Grillpro will delight any BBQ griller or serious barbecue food smoker. If it's a gift or wedding gift and you would like to include a message just add the instructions at checkout. 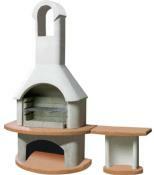 Buy a last minute gift from Planet Barbecue, we usually deliver within 48 hours in the UK and 2 to 4 days in the EEC. Tool set with soft grip handles and stainless steel blades. 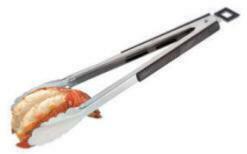 Includes tongs, turner and fork. Super gift idea that will last for years. 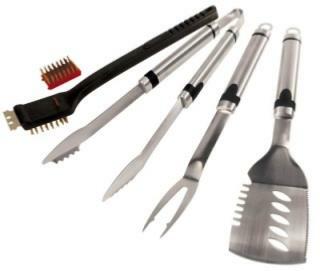 7 Piece Premium Barbecue Genius Tool Set. 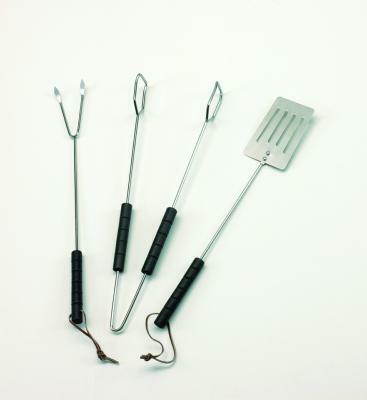 Spatula, Tongs, Fork and 4 X Kebab Skewers. All set in a presentation box. 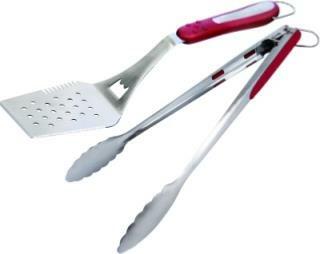 16" Stainless steel tongs with red soft grip rubber handle, serrated edge and bottle opener. 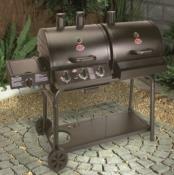 Grill Pro 16" Stainless Steel Locking Tong Turner Combination. 16” multi-use tool with red soft grip rubber inserts. Can be used as a turner, tong or both. Manual lock saves on storage space. 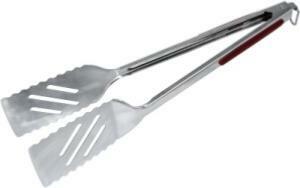 Grill Pro BBQ Spatula and bottle opener. 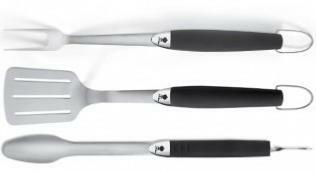 Stainless steel spatula with black handle and cutting blade edge and bottle opener. 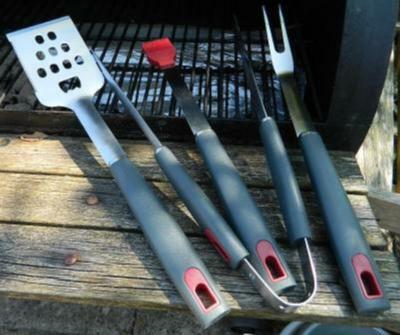 5 Piece Premium Barbecue Genius Tool Set. Includes: Spatula, Tongs, Fork, Cleaning brush and Replacement Grill Brush Head. Locking mechanism and soft grip handle. Large Boxed Stainless Steel Golf Barbecue Tool Set. 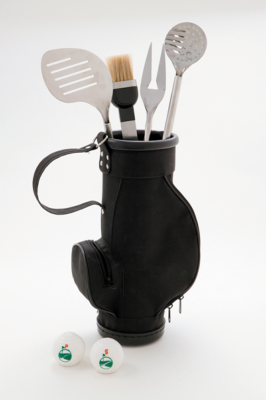 Golf BBQ tools set in a caddy holder. Includes: Spatula, fork and tongs . Tools with handles in the design of golf clubs. Plus strong caddy case. Ideal gift for the golfer in your family. Spatula, Fork, Tongs, Bottle Opener, Cork Screw, Serrated Cutting Edge, Disposable Lighter Slot. Everything you need for the barbecue in one handy multi tool. Carry your food and your grill together in this all-in-one pack. 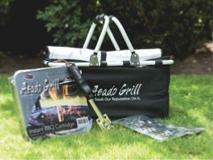 The frame of the cool bag converts into your grill stand to fit the included standard size Instant BBQ. Stainless steel quality tools with stainless steel blades and heavy duty resin handles. 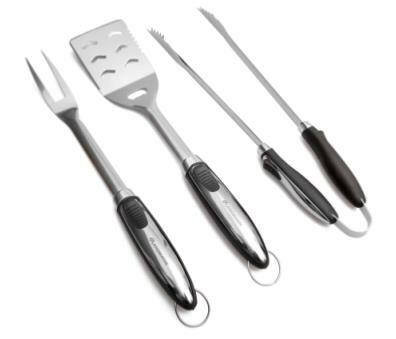 Super quality and very heavy duty 3 piece BBQ tool set. Hard resin handles and heavy gauge stainless steel. 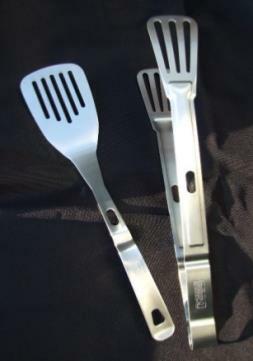 Weber 2 Piece BBQ Tool Set. 16” Stainless steel construction with red soft grip rubber handles . 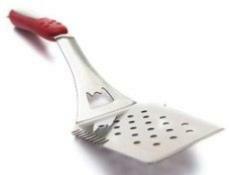 Spatula includes bottle opener, serrated edge for tenderizing and sharp edge for cutting and slicing. 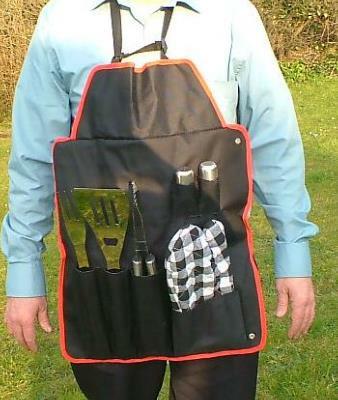 Have fun with these BBQ tools in this tough stylish apron. Fitted with spatula, fork, tongs, glove and salt and pepper.